Home | Publications| Encyclopedia | Canton, Frank M.
(7374, Alva J. Niles Collection, OHS). Lawman "Frank Canton" was born Josiah W. "Joe" Horner in Virginia in 1849. While he was a child, the family moved to Texas, and as a teenager Horner became a cowboy, trailing cattle to Kansas for Texas cattleman Burk Burnett. From 1871 to 1878 Horner engaged in a variety of illegal activities, becoming a fugitive from justice. Jailed in 1877 for robbing a Comanche, Texas, bank, he soon escaped and helped drive a cattle herd to Nebraska. Deciding to join the side of law and order, Horner changed his name to Frank M. Canton and accepted a position with the powerful Wyoming Stock Growers' Association (WSGA). In 1882 he was elected sheriff of Johnson County, Wyoming, serving for four years before again accepting employment with the WSGA. He was a major figure in the Johnson County Cattle War of 1892. Canton moved to Oklahoma Territory in 1894 and served as undersheriff in Pawnee County and deputy U.S. marshal under the famous Judge Isaac Parker. Instrumental in subduing the wild Oklahoma outlaw gangs, he killed fugitive Bill Dunn in Pawnee in 1896. In 1897 he joined the gold rush to Alaska, enjoying a two-year adventure before returning to his wife and daughter in Oklahoma. 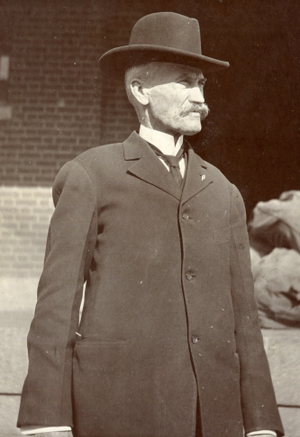 After working in various law enforcement capacities, in 1907 he was appointed by Gov. Charles N. Haskell as adjutant general of the Oklahoma National Guard. Over the next decade General Canton built up the organization. He died on September 27, 1927, at age seventy-eight. His funeral was a major event in Oklahoma City, and he was buried at Fairlawn Cemetery in dress uniform with Masonic rites and military honors. Frank M. Canton, Frontier Trails: The Autobiography of Frank M. Canton (Norman: University of Oklahoma Press, 1954). "Frank M. Canton," Vertical File, Research Division, Oklahoma Historical Society, Oklahoma City. Robert K. DeArment, Alias Frank Canton (Norman: University of Oklahoma Press, 1996). Bill O'Neal, "Canton, Frank M.," The Encyclopedia of Oklahoma History and Culture, https://www.okhistory.org/publications/enc/entry.php?entry=CA048.